The vast multi-purpose grass field is a great place to play soccer, softball, mini golf and other sport activities. Camping is allowed in the field, too (fee required). 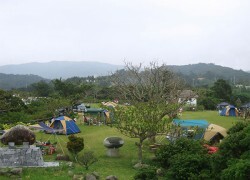 Located at the highest elevation of the park is Ikoi Square, equipped with a 30-meter-long slide and an observation platform from which you can enjoy the view over northern Okinawa's lush vegetation, the East China Sea, neighboring islands and the Haneji Inland Sea. In addition, the platform is also a popular stargazing spot. Pets are not allowed in the park.